So a few years back in Vermont, the fine folks at the Northern Stage invited local cartoonists to the dress rehearsal of their production of the Wizard of Oz to draw. It was a very fun show, with lots of great costumes and dance numbers. 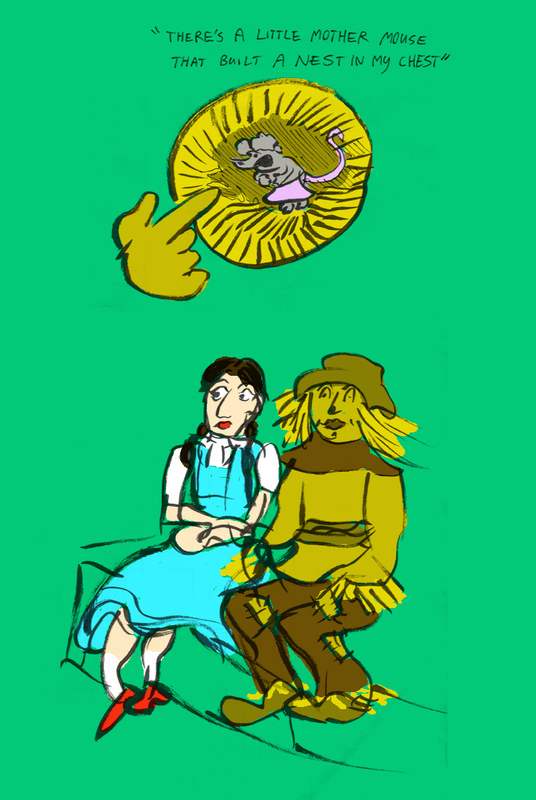 The great thing about the Wizard of Oz is the distinct, iconic characters. I found myself fretting over trying to get a likeness of the actors, then realized you get a lot of leeway with characters. Just the blue dress with pigtails says Dorothy, the shape of the helmet says Tinman. Anyways, it was great fun to pretend to be Al Hirschfeld for the night, and I really hope this becomes a regular event between the cartoonists of White River Junction and the Northern Stage. I dropped some quick computer colors in here at Boston’s Logan Airport as I take my second attempt at getting back to Portland, whose own opera house inspired this event by inviting area cartoonists to draw their opera’s dress rehearsal. I fudged some of the colors, my memory being distinctly non-photographic. There was a kid on a leash freeeaaking out a few minutes ago. Some links to others’ sketches can be found here and here. Big thanks to the great cast & crew, and to Colleen Frakes for organizing.